A travel app unlike any guidebook for only 85 Yen. Time to travel around the world. Explore the World’s unexplored through a series of picture slideshows called, “No Travel? No Life!”. The slideshows contain over 100 pictures with subtitles explaining the countries’ notable sceneries, culture and history. Once through with the slideshow, you should be familiar with the country’s scenery and the facts. * Who want to travel, but rarely have the time. * Who have interests in the cultures and scenery of foreign countries. * Who are stressed and want to escape from the real world. * Who want to show their kids a new place. * Who plan to travel to the country for work or vacation. A bundled app to send people around the world. Jerusalem is a holy city inhabited by the Gods. Abraham had his divine revelation in Jerusalem. Thereafter, people started recording the Jewish history. Jesus visited the holy city of Jerusalem proclaiming love and hope for humanity, however he met his end through crucifixion. Muhammad also spared great efforts in Jerusalem before ascending to heaven. As one of the only places in the world where one feels so close to the Gods, Jerusalem serves as a sanctuary for humankind. 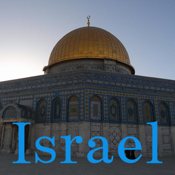 Let’s travel to the sacred land of the Jews, Christians and Muslims. The Dome of Rock sits in the sacred land referenced in the Old Testament of the bible. The Wall of Mourning surrounds the ancient Temple of Jerusalem built in the 10th century and worshipped as a holy place of Judaism. An ancient town sleeps underground beneath the old town of Jerusalem. The Church of the Holy Seplchre built on the Golgotha hill marks the end of Jesus’ excruciating walk up the road called Via Dolorosa. Since the ancient times, religion, ethnic groups and countries flourished and withered in Jerusalem. Today, the streets are full of people with tenacity, strong emotions like hatred and hope. Hear the songs of praises to the Gods as you wander about the city of Jerusalem. Similarly, head to the coast of the Mediterranean Sea to visit the modern city of Tel Aviv or drive along the Red Sea to find the numerous resorts in Israel more modern city, Eilat. From the ancient to the modern, the holy to the secular welcome to the city of Israel where the humans breathe the same air as the Gods.